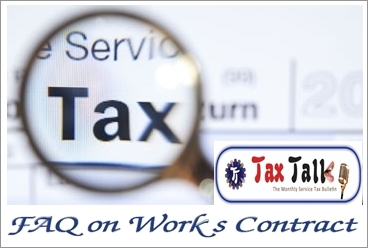 How tax on work contact is imposed? Clause (h) of Section 66E (Declared List) of the Finance Act 1994 (here-in-after referred as `the Act’) is as follows: “service portion in the execution of a works contract”. What do you mean by works contract? What is the scope of this entry? For carrying out any other similar activity or a part thereof in relation to such property i.e immovable or movable property. What is the difference between works contract and sale of goods? In case of works contract primary function is to provide work or service and materials supplied are secondary, whereas in case of sale of goods primary function is supply of materials and providing work or service is incidental. In case of works contract articles produced becomes the property of buyer, property in goods passes by accession and accretion during the possession of work, where as in case of sale of goods “goods” are sold as “goods”. Works contract is taxed as deemed sale, while sale of goods is taxed as actual sale. Whether contract for labour is works contract? No. Contract for labour is different from works contract and labour contracts do not fall in the definition of works contract. In order to come within the ambit of works contract, it is necessary that there should be transfer of property in goods involved in the execution of such contract which is leviable to tax as sale of goods. Pure labour contracts are therefore not works contracts and would be leviable to service tax like any other service and on full value. Would contracts for repair or maintenance of motor vehicles be treated as ‘works contracts’? If so, how would the value be determined for ascertaining the value portion of service involved in execution of such a works contract? Yes. Contracts for repair or maintenance of moveable properties are also works contracts if property in goods is transferred in the course of such a contract. Service Tax has to be paid in the service portion of such a contract. Would contracts for painting of a building, repair of a building, renovation of a building, wall tiling, flooring be covered under works contract? Yes, if such contracts involve provision of materials as well. Else it will be a construction contract only for service portion, liable for service tax in the head of construction service. Construction service are of two type Commercial Construction or Construction of Residential Complex. ‘works contract’ in various State VAT laws? The definition of ‘works contract’ in clause (54) of section 65B of the Act covers such contracts which involve transfer of property in goods and are for carrying out the activities specified in the said clause in respect of both moveable and immoveable properties. This is broadly in consonance with the definition of ‘work contract’ in most of the State VAT laws. However, each state has defined ‘works contracts’ differently while dealing with works contract as category of deemed sales. There could, therefore be variations from State to State. What is the way to segregate service portion in execution of a works contract from the total contract or what is the manner of determination of value of service portion involved in execution of a works contract? Value of service portion in the execution of a works contract shall be equivalent to the gross amount charged for the works contract less the value of property in goods involved in the execution of the said works contract. Other similar expenses relatable to supply of labour and services; and Profit earned by the service provider relatable to supply of labour and services. Where value added tax or sales tax has been paid or payable on the actual value of property in goods transferred in the execution of the works contract, then, such value adopted for the purposes of payment of value added tax or sales tax, shall be taken as the value of property in goods transferred in the execution of the said works contract for determination of the value of service portion in the execution of the said works contract. What do you mean by the term “total amount” mentioned above? The value added tax or sales tax, if any, levied thereon; Provided that the fair market value of goods and services so supplied may be determined in accordance with the generally accepted accounting principles. Whether composition method is optional? (i)…” The words used are “has not been”. They are different from the words “cannot be”. Thus, even if value can be determined under value of service method (clause (i) of rule 2A of the Valuation Rules) the person liable to pay service tax may choose to determine value under composition method (clause (ii) of rule2A of the Valuation Rules). Whether non–payment of VAT/Sales Tax by service provider would not amount to works contract services? In order to classified under the Works Contract services, the property in goods transferred in execution of works contract must be leviable to VAT/Sales tax. As some of the State VAT laws provide exemption to small scale dealers and they are not required to pay VAT/Sales tax if their turnover does not exceed the prescribed limit. This does not mean that Sales tax/VAT is not leviable, it means that tax is levied but exempt from the payment. Thus, non-payment of sales tax or VAT by the service provider, owing to exemption or otherwise, cannot be the basis for concluding that the contract is not a works contract. Whether any exemption is available in relation to this entry? Who will be liable to pay service tax for works contract services? 1. Service provider should be located on taxable territory. 3. Services should be provided to business entity registered as body corporate, located in taxable territory. If all three condition satisfied service tax is payable in partial reverse charge or joint charge. And the service provider and service receiver both are liable to pay 50% of service tax separately.